Hands-on cooking demo with Rainshadow Organics. Your mother told you not to do it. Maybe she swatted your hand away from the serving bowl or pointed at your fork and insisted you learn how to use it. Though playing with your food isn’t socially acceptable in most circles, here are four times it’s totally okay to do it during your Bend vacation. The farm-to-table movement has exploded in recent years, and Rainshadow Organics embraced it with their popular Longtable Dinners. 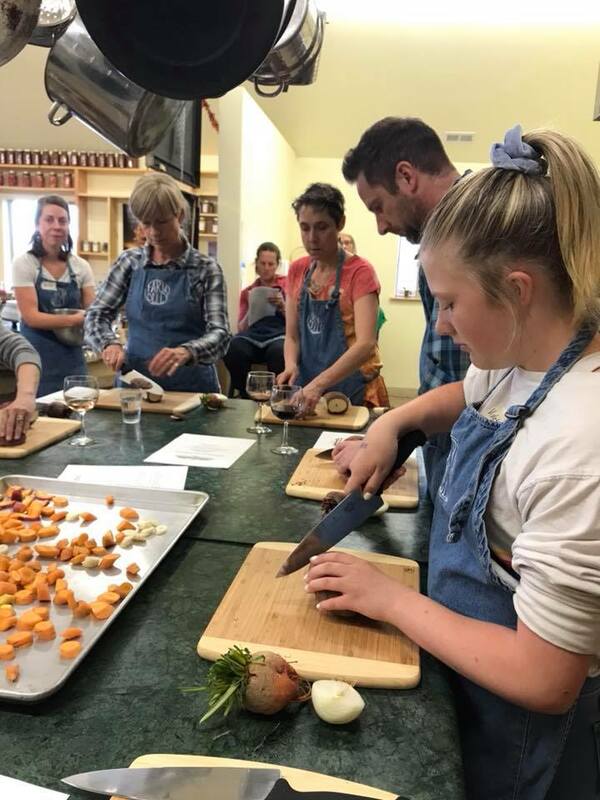 But they’re taking things to the next level with their new series of hands-on cooking classes in which participants not only prepare the meal, but help harvest the food themselves. 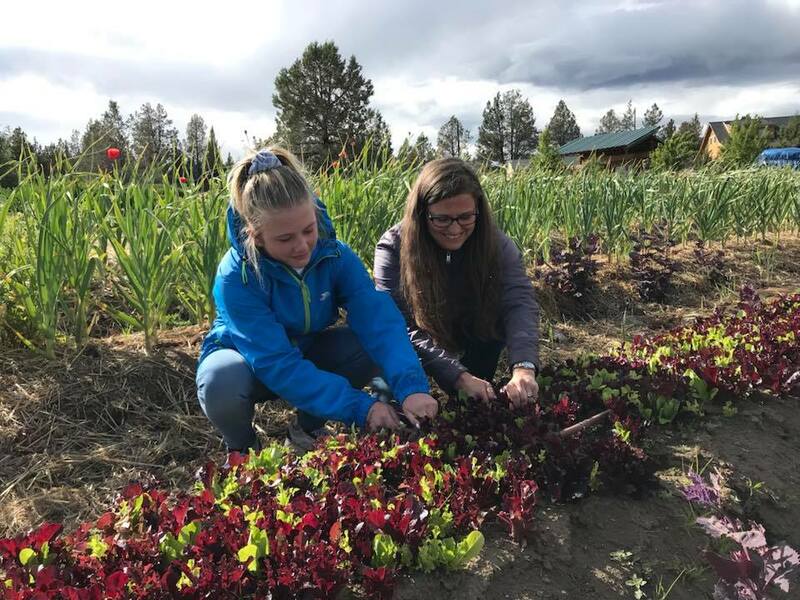 Blogger Tawna harvests greens for salad with 12-year-old Violet during one of Rainshadow Organics’ cooking classes. Students fortify themselves at the start of class with a selection of appetizers made from ingredients grown right on the farm. That’s followed by a farm tour where participants help harvest items for the meal and see farm animals like the friendly cow (Ginny Weasley, in case you’re wondering) who generously provides dairy ingredients for the meal. Then it’s time to roll up your sleeves, don your apron, and get to work chopping, slicing, and preparing the fresh ingredients. A professional instructor offers guidance that can range from knife skills to identifying edible flowers, and in the end, participants enjoy a farm-fresh meal they’ve prepared with their own two hands.Upcoming classes include Pizza Making from Scratch (July 7 and 21), Pickling (August 9 and 16), Sauerkraut & Fermentation (September 6), Tomato Sauce (September 13), but keep an eye on this page for the addition of more classes. Also keep in mind that class sizes are SUUUUPER small, so sign up quickly if there’s one that piques your interest. Rainshadow Organics is about a 40-minute drive from Bend, and it’s a chance to see some pretty stunning farm country along the way. If you’d rather try a cooking class a bit closer to your Bend home base, check out The Kindred Creative Kitchen. Their offerings range from desserts to professional chef training, and they even feature classes just for kids. Speaking of kids, here’s one just for them. 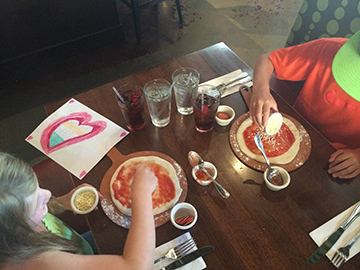 At Flatbread Community Pizza, kids get to play with their food by making their own dinners. For children 12 and under, Flatbread Neapolitan Pizzeria will set them up with fresh dough, sauce, cheese, and the toppings of their choice. While the young’uns create their own custom pizzas, moms and dads can enjoy wine, beer, cocktails, sandwiches, salads, or their own grownup pizza. I’m partial to the caramelized fennel and sausage pizza with roasted kale, mozzarella, sautéed Portobello, fontina, and parmesan, which pairs nicely with a big salad and a glass of Chianti. Ditch the knife and fork with that pizza slice to give you an extra hands-on experience. There are some foods you’re allowed to grab with your bare hands, and you’ll find plenty of it in Bend. Blackened steelhead tacos from Worthy Brewing are the ultimate handheld meal. 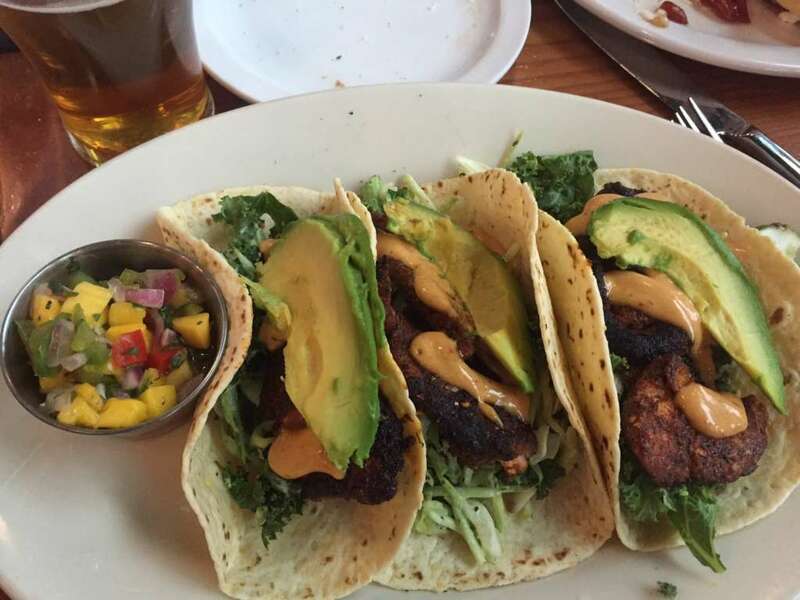 Tacos are the ultimate finger food, and you’ll find some of Bend’s best at El Sancho, Barrio, Hola, and Longboard Louie’s. Each of those places offers an infinite variety of taco fillings and preparation styles, but if fish tacos are your ultimate holy grail, check out this roundup of Bend’s best fish tacos. Wraps are another awesome option for meals you can grip with a fist, and Parilla Grill makes some of the best around. The Bombay Bomburrito is my personal fave, featuring a soft flour wrap filled with ginger banana chutney, cilantro lime rice, purple cabbage, bamboo shoots, your choice of protein, green curry sauce, wasabi vinaigrette, gorgonzola, and chili corn salsa. A regular ol’ burrito will do, too, and Los Jalapeños is my go-to spot for the ultimate handheld dining experience. Show up early for their mouthwatering breakfast burritos, or make late-afternoon stop to take advantage of their happy hour deals that include a margarita. Get your hands on some farm fresh produce at the Bend Farmers Market. Want to really get your hands dirty? A big, goopy burger should do the trick! Check out this post for a roundup of Bend’s best burgers. 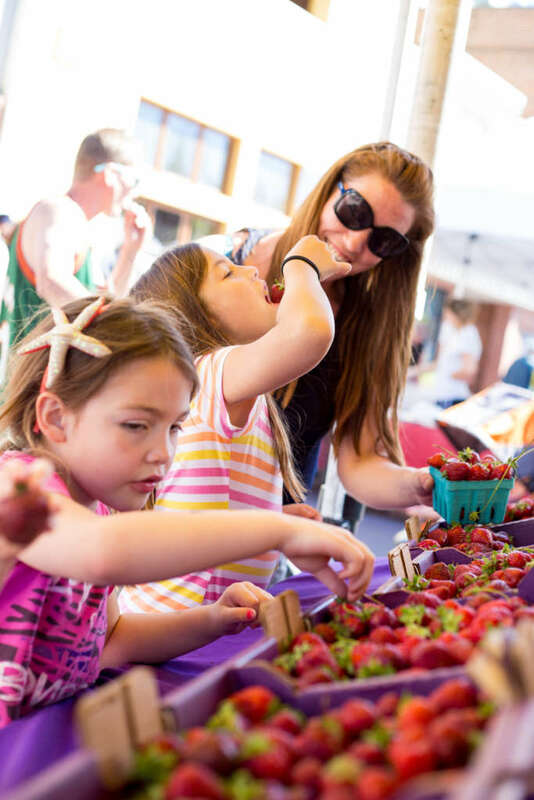 While you’re discouraged from squeezing the melons or squishing the broccoli, the Bend Farmers Market offers ample opportunity to get your hands on some super-fresh produce and locally-made edible goodies. The main Farmers Market takes place every Wednesday from 2-6 p.m. in the Brooks Alley just above Drake Park, but there’s also a new Eastside market beginning July 5 that takes place each Thursday from 2-6 p.m. in the Whole Foods parking lot. There’s also a Farmers Market in Northwest Crossing on Saturdays from 10 a.m. to 2 p.m. If you’re renting a Bend vacation home or a hotel room with a kitchen, it’s the perfect chance to grab fresh ingredients. Just don’t grab too hard or you’ll bruise the peaches. Really loved the idea of going organic, which is something we all should look forward. Keep up the good work.